CBD (Cannabidiol from Industrial Hemp) is the "Holy Grail" of natural health, making some dangerous, expensive drugs no longer the (sic) "better choice." And the demand for CBD is exploding world-wide. 1. June 2014: Natural Solutions Health LLC and Agrofutoro enter into a joint venture to grow, process and wholesale Industrial Hemp from Chile. 2. October 2014: Chile's Health Department issues a letter allowing the cultivation of High-CBD Hemp and acknowledging its potential health benefits. 3. January 2015: Chile's Agricultural Department issues the Planting Permit. 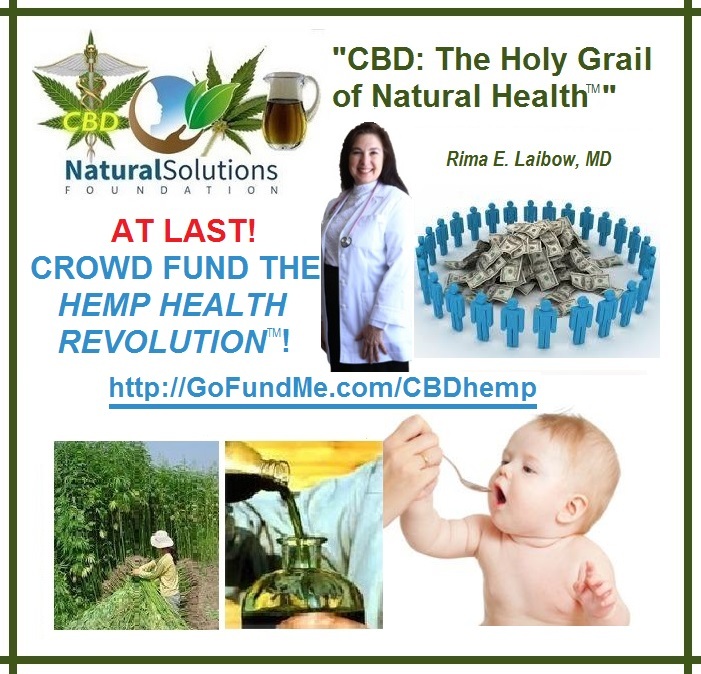 Rima E. Laibow, MD, Natural Solutions' Medical Director says "CBD is the Holy Grail of Natural Health - All Help, No High!" Some uninformed authorities have sought to "demonize" Cannabidiol (CBD) -- a nutrient from Industrial Hemp. That's all changing now since, according to our lawyers, CBD is legal in every State in the US and in a host of foreign countries: CBD, made by our own bodies as well as provided by the hemp plant, is a safe nutrient that supports homeostasis by supporting great immune function. CBD works with the body - not against it - to support comfort (when confronted by pain), support normal function (when concerned about seizures), regulate inflammatory processes, stimulate immune function, support neurological balance and much, much more. The Big Boys want to control it, and, like all real alternative medicine, make sure THEY own it, jack up the price and then suppress it - the usual! We say "NO! Certified organic CBD should be easily and inexpensively available to everyone." So, with your help, we're making that happen! My name is Rima E. Laibow, MD. I'm the Medical Director of the Natural Solutions Foundation, founded ten years ago, dedicated to YOUR right to make your own health choices, including organic CBD products. We're ready to grow the world's first totally Certified Organic CBD hemp in Chile. We have the exclusive rights to market 100% of the production for 10 years growing the ONLY commercial industrial hemp in Chile and the ONLY Certified Organic industrial hemp in the world!!! 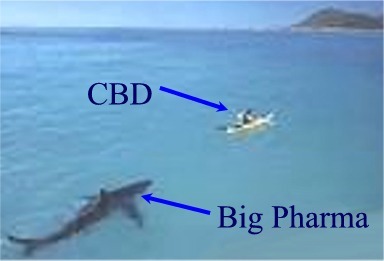 The big investors want to inflate the prices and turn CBD into a drug. WRONG!!! So we are turning to you to help us raise the money to make clean, solvent-free CBD available. We need money to build our greenhouses so we can grow not 1 crop per year (outdoor growing) but 5-6.5 crops per year (indoor growing) with no chemicals, no impurities and, as I love to say, "No High, Only Help!" Each greenhouse has 3 growing areas. The more funding we receive, the more CBD we can produce and the lower we can bring the price! To say, "Thank you" for your help in making this medical dream a reality, let me give you two gifts. The first is a subscription to my own Newsletter, which I call the 'Health Freedom Action eAlert'. It's filled with useful and important health and freedom info. This Newsletter will change your life. My second gift is my own Immune System Protocol to help you keep your immune system humming in the face of bacteria and viruses that want to make you sick! I'll send you an email with access to the Protocol when we receive your donation. By the way, your donation at any level is most welcome and apprecaited. We've created a reward system of additional "Thank you" gifts, too. Oh, yes, one more thing: when you help make clean, inexpensive CBD available, you're making a tax deductible contribution so Uncle Sam (who's been demonizing hemp and hemp products for decades) is helping you to make CBD a reality, whether he wants to or not! Thanks so much for your help. Every donation makes a difference. Please share it as widely as you can. A number of people have expressed interest in equity positions asking if there were a way to participate at less than the $100,000 minimum. There is. Find out about it tonight by attending the call using the info below or contact me directly at 973.300.4594. A number of people wanted to have a private talk about the Foundation's CBD project, so I set up a conference call with Dr. Rima and Gen. Bert for this Thursday evening. We'll report on progress. We will also give people an opportunity to get together and pool resources to participate in the project. If you want to participate in an investment pool, we need to have you on the call. Great meeting today with the Director of the Chilean Public Health Department. Turns out that although hemp and its products was demonized in Chile thanks to the US program for the same purpose, folks here are seeing the light and they want CBD for their own people. So there is great interest there in making sure that they have access for Chileans. That is very good. What is not so good is that a foreign investor, whom we believe represents Big Pharma interests has flown to Chile to try to buy up all of the equity in the project. You know why! So do we. We need you to spread the word now, far and wide. This is about making sure that CBD is widely available at the lowest possible price. Share this link every way you can and invite your circle of influence to join you in keeping CBD available. Which do you want first? The bad news or the good news? Or the other good news? First, we have a matching grant! We have received a matching grant up to $10,000! Any funds received up to after this moment, 1 PM January 19, 2015, will be matched by a donor so that your donation doubles! That makes it especially useful to send this information and our link, www.GoFundMe.com/CBDHemp, out to your circle of influence since every dollar becomes two! Next good news: the Public Health Department of Chile, where the CBD project is located and licensed, are the people in charge of registering CBD. They have expressed strong interest in having it available for the population here. Tomorrow morning I will meet with the Director of that department, together with our Chilean partner, to help them move toward regulation of the CBD molecule as a nutrient, which it is, with astonishing healing and restorative powers, which it has. This is HUGE for us all. OK. Now for the not so great news: We were pretty clear that we were trying to keep the big money out so that we would not be pushed out of having this miracle molecule available to us, our health in our hands. Well, we have been approached by a German investor, very possibly connected with the Pharmaceutical industry, of course, who wants to put up all the money that we need. Let me be totally frank: we need money to build the greenhouses, buy and set the seeds, etc. No doubt about it. If the crowd funding mechanism falls short of our needs for this project, we will have no choice but to open our hand to the flow of big money that we have been trying to keep the project away from. That is, after all, why we created this Crowd Funding site. We have been beating them off with a stick, so to speak, but the money has to come from somewhere. Better us than them, but to make this happen, each person who really "gets" what this is about (that is, YOU) need to protect your own interests in having CBD available and spread the word to your circle of influence with an urgent message. I doubt that we will have much more than a week to 10 days before we have to give this big source a thumbs up or down. So it is really up to us. Now. Spread this link, www.GoFundMe.com/CBDHemp, and let people know that you have already made your donation and strongly suggest they do the same. So take the good news and enjoy it the way we are and take the bad news and act on it while we still have time! Congratulations! However, it IS Clear that effective medical therapy Includes a slight amount of THC ( Tetrahydrocannabidol) to KILL CANCER, eliminate seizures, and so much more healing. The HEMP Plant does not provide for this important healing component, only the cannabis sativa plant can do that! Dr. Abhrams at the University of San Francisco, proved out, Both molecular components of CBD & THC are necessary to induce cancer cell DEATH! So, I am Clear Here, you are more interested in Beating Big pharma to the CBD Punch, rather than "HEALING the NATIONS"? Please Advise. 10% Discount Coupon for Dr Rima Recommends™ CBD products including Green Gold Coffee Elixir with CBD - discount good for 1 year from donation. I wish. I could do more. You are a fearless couple and I applaud you. Let's support natural medicine that doesn't need millions of dollars in trial money to know that it works !! !